Hong Kong has a large population and limited space, yet its traffic network is well established. Buses are the second-most commonly used form of public transport, bested only by the MTR. However, most buses use diesel fuel, which emits a large quantity of particulate matter and nitrogen oxides — adversely affecting air quality in Hong Kong. The Hong Kong Air Pollutant Emission Inventory released by the Environmental Protection Department in 2013 showed navigation and road transport are the main sources of air pollutants, with road transport emitting 1,090 tonnes of respirable suspended particulates (RSP). To improve air quality on the streets and reduce the emission of greenhouse gases, diesel buses can be replaced with electric buses. Electric vehicles (EVs) have been adopted by many big cities around the world. Beijing, Shanghai, Osaka and London have started to popularize EVs. Shenzhen, just across the border from Hong Kong, has 3,050 buses that use new energy for public transport, and there is a plan to add 3,600 more electric buses to the city. However, in Hong Kong, there were only 2,889 EVs for road use by the end of September. While the number of total licensed vehicles in Hong Kong reached 681,000 in 2013, the ratio of EVs to traditional vehicles was less than 0.5 percent. These statistics show that EVs are still not very popular in Hong Kong. We are introducing electric vehicles to Hong Kong more slowly than the cities around us, as well as those in Europe and America. London is also a heavily populated city, the citizens of which usually travel by bus. There are 9,000 buses in London carrying 6.5 million people per day – a demand equal to that of Paris and New York City combined. The London government has been promoting electric buses and is now conducting a five-year trial of electric double-decker buses. 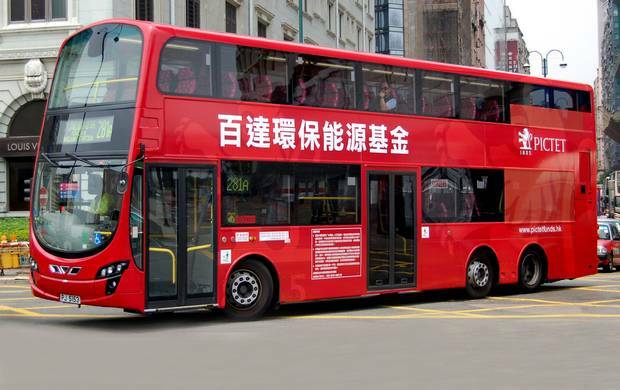 Recently, the world’s first electric double-decker was unveiled to the public when President Xi Jinping visited Britain. 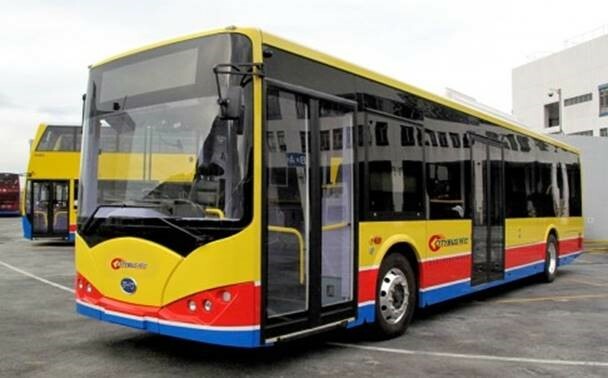 The British government has also placed an order for 51 electric buses, and it is expected that these orders will continue to increase as citizens embrace the idea of going green. Transport for London (TfL) is purchasing EVs and hybrid buses with the aim of having 300 electric-only buses by 2020. Other governments around the world are likewise promoting electric public transport and EVs, with different targets that aim to reduce emissions. The National Development and Reform Commission in China said it aims to lower the operating costs of EVs by 2020 through financial subsidies and planned charging facilities, creating more incentives for consumers to purchase EVs. Although Hong Kong has very good plans for developing electric public transport, there is still a need to keep up with other countries in terms of development. The transport systems in Hong Kong and London are very similar. Hong Kong can take London’s strategy as a reference and plans to bring in the benefits of EVs and help Hongkongers enjoy cleaner air and blue skies. Safety is of the utmost importance when it comes to public transport. 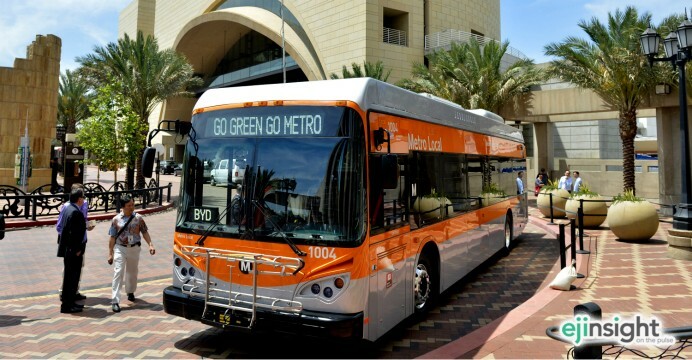 Thanks to technological advancement that has led to using an iron-phosphate battery as an energy source, electric buses are not only safe but also stable and environmentally friendly. An iron-phosphate battery can handle extreme environmental conditions and will not act adversely if a collision occurs or in cases of burning, short circuit, needling, high temperature, compression or overcharging. Such a battery is itself a green product, generating no pollution during its manufacturing process and, with a long battery life, lasting the entire life cycle of an EV. Used iron-phosphate batteries can even be recycled. Many people are concerned about the endurance of EVs. Some also worry that using EVs for public transport will affect efficiency. In fact, some single-decker buses need to charge for only four hours to run 250 kilometers, and there have been endurance breakthroughs in electric bus design. The newly invented electric double-decker can run 300 km when it is fully charged. Hong Kong Island is 50 km around, which means electric buses can travel around it five or six times once fully charged. Air pollution has been a key issue in Hong Kong for some time. The Health Environmental Index from the University of Hong Kong shows 2,616 people died earlier than normal last year because of air pollution. Therefore, we have to tackle related problems and find the most effective ways to improve air quality. Promoting EVs is not only a global and environmentally friendly trend, it can also improve the image of a city. 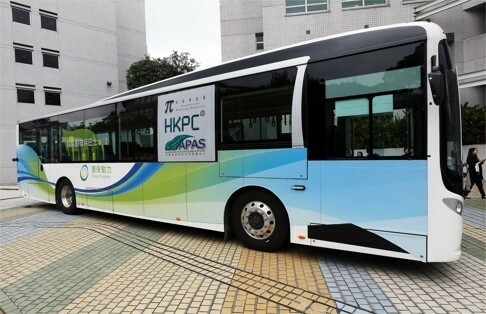 Introducing zero-emission electric buses is a direct and effective way to reduce air pollution at its source and pave the way for Hong Kong to be a zero-emission city. It’s been dubbed the “diesel dupe”. The Environmental Protection Agency (EPA) found that many VW cars being sold in America had devices in diesel engines that could detect when they were being tested, changing the performance accordingly to improve results. The German car giant has since admitted cheating emissions tests in the US. VW has had a major push to sell diesel cars in the US, backed by a huge marketing campaign trumpeting its cars’ low emissions. The EPA’s findings cover 482,000 cars in the US only, including the VW-manufactured Audi A3, and the VW brands Jetta, Beetle, Golf and Passat. But VW has admitted that about 11 million cars worldwide, including eight million in Europe, are fitted with the so-called “defeat device”. The device sounds like a sophisticated piece of kit. “We’ve totally screwed up,” said VW America boss Michael Horn, while the group’s chief executive at the time, Martin Winterkorn, said his company had “broken the trust of our customers and the public”. Mr Winterkorn has now left the company as a direct result of the scandal and has been replaced by Matthias Mueller, the former boss of Porsche. “My most urgent task is to win back trust for the Volkswagen Group – by leaving no stone unturned,” Mr Mueller said on taking up his new post. VW has also launched an internal inquiry. With VW recalling almost 500,000 cars in the US alone, it has set aside €6.5bn (£4.7bn) to cover costs. The carmaker has said it will begin recalling cars in January. But that’s unlikely to be the end of the financial impact. The EPA has the power to fine a company up to $37,500 for each vehicle that breaches standards – a maximum fine of about $18bn. Legal action from consumers and shareholders may follow, and there is speculation that the US Justice Department will launch a criminal probe. Then, or course, there is the cost of fixing all the cars. What started in the US has spread to a growing number of countries. The UK, Italy, France, South Korea, Canada and, of course, Germany, are opening investigations. Throughout the world, politicians, regulators and environmental groups are questioning the legitimacy of VW’s emissions testing. France’s finance minister Michel Sapin said a “Europe-wide” probe was needed in order to “reassure” the public. At this time, only cars in the US named by the EPA are being recalled, so owners elsewhere need take no action. However, with about 11 million VW diesel cars potentially affected – 2.8 million cars in Germany itself – further costly recalls and refits are likely. Half of the company’s sales in Europe – VW’s biggest market – are for diesel cars. No wonder the carmaker’s shares are down 30% since the scandal broke – with other carmakers also seeing big falls in their stock prices. It’s still unclear who knew what and when, although VW must have had a chain of management command that approved fitting cheating devices to its engines, so further departures are likely. That’s for the various regulatory and government inquiries to determine. California’s Air Resources Board is now looking into other manufacturers’ testing results. Ford, BMW and Renault-Nissan have said they did not use “defeat devices”, while other firms have either not commented or simply stated that they comply with the law. That sounds like EU testing rules need tightening, too. Car analysts at the financial research firm Bernstein agree that European standards are not as strict as those in the US. However, the analysts said in a report that there was, therefore, “less need to cheat”. So, if other European carmakers’ results are suspect, Bernstein says the “consequences are likely to be a change in the test cycle rather than legal action and fines”. It’s all another blow for the diesel market. Certainly is. Over the past decade and more, carmakers have poured a fortune into the production of diesel vehicles – with the support of many governments – believing that they are better for the environment. Latest scientific evidence suggests that’s not the case, and there are even moves to limit diesel cars in some cities. The Ombudsman will investigate whether the Environmental Protection and Transport departments conducted adequate planning and coordination before the implementation of a new initiative to control vehicle exhaust emissions. Ombudsman Connie Lau Yin-hing said yesterday complaints received by her office suggest the two departments have been using different emissions standards, calling into question whether their efforts were properly planned and coordinated. She said the measure to control emissions was introduced in September last year with good intentions, but if it was not properly implemented, then its effectiveness would be compromised, causing much inconvenience and frustration to vehicle owners. Under the new initiative, the EPD deployed remote sensing equipment at various locations throughout the territory to monitor the levels of nitrogen oxides and other vehicle exhaust emitted. Motorists found to have excessive exhaust emissions receive notices to arrange within 12 working days for their vehicles to undergo an emissions test with a chassis dynamometer (commonly called a “treadmill”) at Designated Vehicle Emission Testing Centres. Failure to pass the test may lead to cancellation of the vehicle licenses. However, the Office of the Ombudsman received complaints from vehicle owners alleging that shortly after their vehicles had passed the annual examination required by the Transport Department, they were notified by the EPD that their vehicles had to undergo a treadmill test. A preliminary inquiry by the Ombudsman has revealed the emissions standards adopted in the idling emissions test of the annual vehicle examination does not include nitrogen oxide emissions. Moreover, the 22 Designated Car Testing Centres carrying out the annual examination required by the Transport Department are not equipped with “treadmills” for checking nitrogen oxide emissions. In other words, vehicles that pass the annual examination do not necessarily meet the exhaust emission standards of the treadmill test. Furthermore, there are currently only four emission testing centers authorized to conduct the treadmill test. Whether they can cope with the demand is highly questionable. Besides, it is noted operators of designated car test centers have indicated they will face various problems such as manpower, facilities, space, and noise nuisance if they have to install treadmills.